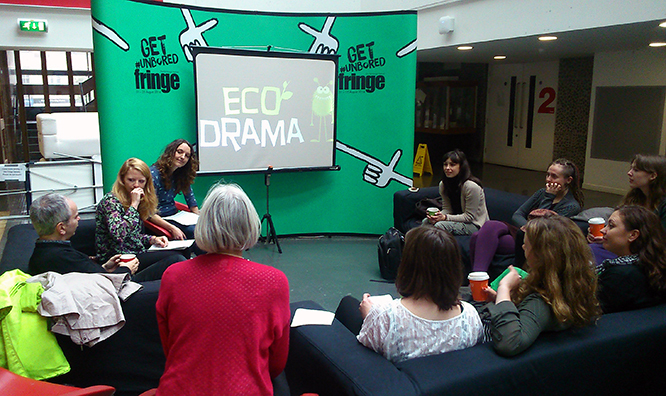 Our Edinburgh Green Tease group met for its third gathering on 25 August 2014 at Fringe Central. The group heard from Emily Reid, Director of Eco Drama, who led a discussion centred on how design choices influence the sustainability of a production. Eco Drama is a Scottish theatre company that aims to “embed sustainability and ecology at the heart of the experience,” touring their productions predominantly to school and community groups. Reid explained that in founding the company she was “keen to develop an arts practice that did things a little differently,” which has come to fruition in the company’s use of a touring van run on reclaimed biodiesels and its limited print publicity. A key characteristic of the Eco Drama productions is their immediate call to action, often enabled directly by the group. For example, The Worm: An Underground Adventure brings both the production and an introductory vermiculture workshop to schoolchildren, teaching them about the ecosystem services provided by worms in-situ. Another production, The Forgotten Orchard, has seen the planting of 34 school orchards reminiscent of Scotland’s historic apple production. The Magic Van is another feature of Eco Drama that is quite unique; using repurposed oil from Indian and Chinese takeaways, the production company’s mode of set transportation emits 85% less carbon emissions than a traditional van would. More information about Eco Drama’s Magic Van can be found in our article #GreenFests: Behind the Wheel. Reid mentioned the group brings along vials of the biofuel in all stages of the reclamation process to help kids understand the idea. Our Green Tease discussion covered ideas of sustainability evident in the gathering’s immediate surroundings; held at Fringe Central, our Edinburgh Green Tease occurred alongside the Edinburgh Festival Fringe Reuse and Recycle Days. This year’s Reuse and Recycle Days were a roaring success, with an extensive swap-shop of set materials, costumes and props. It was mentioned during our discussion that the concept of set and costume reuse is an underutilised asset for many production companies. An emphasis on more reuse would shift the linear structure of making, using and disposing towards a more circular approach of cradle to grave reuse, repurposing or recycling. Companies like Stage Bitz and Set Exchange are doing this via the internet, but more localised approaches seem to be lacking. We also discussed the importance of bringing designers into the planning stages of a production earlier rather than later. Quoting the Design Council, Reid mentioned “80% of a product’s sustainability is locked in at the design stage” proving the importance of communicating sustainability aims clearly to all members of the production from its inception. In recent years, structural and funding changes have led to the use of more freelance designers rather than full-time in-house designers, which can often be a pitfall as the relationship between director and designer is not as well established. A question discussed at the Green Tease gathering was- “What are the creative possibilities of setting rules?” The setting of rules certainly worked in favour for The HandleBards, winners of the 2014 Fringe Sustainable Practice Award. The production aimed to use only set items that were bicycle parts or something that could be used whilst camping, as cycling and camping is the group’s mode of touring. Through adapting to this rule set for themselves, The HandleBards reached a higher level of creativity rather than succumbing to the pressure of having restrictions on their practice. “We (Eco Drama) try to be green models otherwise it feels a bit false” Reid explained, a thought that resonates consistently through their creative operations and sustainable themes. Through the discussions we’ve had at our Edinburgh Green Tease gatherings thus far, this seems to be a common aspiration with myriad unique and innovative solutions. Information about our next Edinburgh Green Tease will be published soon. Follow us on Twitter or ‘Like’ us on Facebook to hear about the event!